Physical activity is defined as any bodily movement produced by skeletal muscles that result in energy expenditure. Exercise is a subset of physical activity that is planned,structured, repeated and has a final or an intermediate objective to the improvement or maintenance of physical fitness. Pregnancy can be seen as a great time for lifestyle modifications. Moderate intensity exercises are proven to be beneficial for both mother and fetus in low risk pregnancy with the necessary modifications. In the United States, one study reported that only 15.8 % of women are engaged in exercises during pregnancy at the recommended level. Weight gain during pregnancy , known as gestational weight gain (GWG). The Institute of Medicine recommends GWG for underweight, normal weight, overweight, and obese women of 12.5-18 kg, 11.5-16 kg, 7-11.5 kg and 5-9 kg respectively. A high percentage of women exceed the recommended weight. Excessive GWG is associated with high risk of gestational diabetes mellitus (GDM), hypertension, cesarean delivery and postpartum weight retention. Regular physical activity during pregnancy can reduce GWG by an average of 6.8 pounds compared to women who do not exercise regularly. Pregnancy is accompanied by many cardiac and respiratory changes that begin during the fifth week of gestation and last until about a year after delivery, Cardiac output and blood volume increase up to 40%. 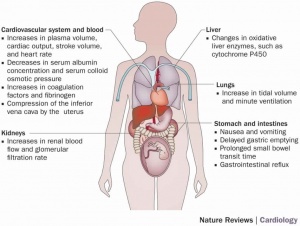 Tidal volume and oxygen consumption (VO2) also increase to supply the oxygen requirements of the fetus. Aerobic exercise such as swimming, static cycling and general floor exercise programs, at least two to three times per week is recommended to maintain cardiovascular fitness, reduces ventilatory demands, enhances the breathing pattern and eventually inhibits exertional breathing problems occur in pregnancy. Pregnancy can also be a time of major emotional changes. Many women suffer alterations in mood and even prenatal depression. Recent studies have estimated the prevalence of depression during pregnancy to be between 10% and 20%. The women who keep fit during pregnancy are more relaxed and cope better with the emotional and physiological strains of pregnancy, this is attributed to a number of positive effects from exercise such as weight management, better body image and self-esteem, improved sleep, and increased energy levels. Exercise is also proven to be effective in treating antenatal depression. Pregnant women typically develop lumbar lordosis, which contribute to the very high prevalence (50%) of low back pain in pregnant women. Exercise, in general, in addition to lumbar stabilization exercises can help to reduce the intensity of back pain. Pregnant women who maintain a regular exercise routine may experience less pain and shorter labor. This is attributed to the exercise effect on inducing metabolic and hormonal changes that may impact uterine contractility and endurance. 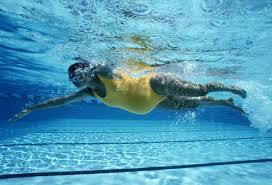 Exercises during pregnancy are also associated with reduced need for Cesarean section. Pelvic floor strengthening exercises during pregnancy are helpful in prevention and reducing the symptoms of urinary incontinence. It is generally recommended that women with diastasis recti abdominis (separation of the abdominal muscles) avoid abdominal strengthening exercises, such as curl-ups, until they are able to consult with a physiotherapist. Preeclampsia is a serious complication of pregnancy occurring in about 2% to 8% of women. it is defined by increases blood pressure and protein in the urine, but women often suffer no symptoms initially. Preeclampsia might interfere with food and oxygen passing to the baby, by constriction of blood vessels in placenta, thus inhibiting baby's growth and causing preterm delivery. It may also affect the mother's kidneys, liver, brain and or clotting system. Physical activity has been shown to increase blood flow and reduce risk of high blood pressure. So there is the potential for exercise to help prevent pregnant women developing preeclampsia. Gestational Diabetes Mellitus (GDM) is one of the most common complications of pregnancy. GDM is associated with a wide range of adverse outcomes for women and their babies. A study found that women who engaged in physical activities before and during pregnancy experienced 69% reduced risk of developing GDM. Exercises are not associated with birth weight reduction. And found to reduce the risk of preterm birth.. Exercises boost the neuro-behavioral profile and orientation level of the new born; they are more alert and interested in their surroundings, and less demanding on their mothers. Also, babies of physically active pregnant women are lighter and leaner than offspring from nonphysically active pregnant women. A study that compared placental growth and morphometric measurements found faster placental growth rate, and greater scores on the morphometric indexes of placental function with exercising pregnant women. Although it is recommended that all women participate in physical activity and exercise throughout their pregnancies, there are some contraindications to participating in exercise. Women with absolute contraindications should not participate in strenuous activities. Women who present with relative contraindications should discuss the risks and benefits of exercise with their obstetric care provider prior to engaging in physical activity or exercise. The ACSM recommends reviewing the overall health, obstetric, and medical risks before prescribing an exercise program to a woman who is pregnant. In the absence of contraindications a pregnant women should be encouraged to engage in regular, moderate intensity physical activity. Pregnant women are encouraged to spend 30 minutes or more of moderate intensity physical activity on most, and preferably all days of the week. Moderate intensity physical activity is defined as activity with an energy requirement of 3-5 metabolic equivalents (METS). For most healthy adults, this is equivalent to brisk walking at 3-4 mph. After the 13th week of pregnancy, about (300 kcal) per day are required to meet the metabolic needs of pregnancy. this energy requirement is increased further when daily energy expenditure is increased through exercise, especially with weight bearing exercises, such as walking. Proper hydration and subjective feelings of heat stress are very important. The supine position should be avoided as much as possible during rest and exercise after the first trimester, as it can obstruct venous return. Motionless standing also should be avoided as it is associated with a significant decrease in cardiac output. Exercises that use large muscle groups in a continuous rhythmic manner such as aerobic exercises, walking, hiking, jogging/running, aerobic dance, swimming, cycling, rowing, cross country skiing, skating, dancing and rope skipping are beneficial and has not been associated with adverse effects. However, extra caution should be taken with activities that increase the risk of falls. Resistance Training (low weights with multiple repetitions) is safe and effective during pregnancy. The recommended intensity of physical activity should be 60-90% of maximal heart rate, and rating of perceived exertion should be 12-14 ( somewhat hard) on the 6-20 scale for pregnant women who did not engage in regular exercise before pregnancy. Women who were regular exercisers before pregnancy and who have uncomplicated, healthy pregnancies should be able to engage in high intensity exercise programs. Non-stress fetal heart testing and ultrasound to assess fetal growth should be considered if clinically indicated in high intensity exercisers. The 2019 Canadian guideline for physical activity throughout pregnancy was written following a comprehensive systematic review of the evidence. The review aimed to provide "evidence-based recommendations regarding physical activity throughout pregnancy, in the promotion of maternal, fetal and neonatal health". The outcomes evaluated were maternal, fetal and neonatal morbidity, or fetal mortality during and following pregnancy (outcomes for both the pregnant woman and the fetus/baby were evaluated). "The 2019 Canadian Guideline for Physical Activity throughout Pregnancy represent a foundational shift in our view of prenatal physical activity from a recommended behaviour to improve quality of life, to a specific prescription for physical activity to reduce pregnancy complications and optimize health across the lifespan of two generations. It is critical that these Guidelines be implemented into clinical practice to achieve the significant and potentially lifelong health benefits for both the mother and the child." The Motivate2Move website, created by Wales Deanery, has a useful page on Exercise During Pregnancy. ↑ 1.0 1.1 Caspersen CJ, Powell KE, Christenson GM. Physical activity, exercise, and physical fitness: definitions and distinctions for health-related research. Public health reports. 1985 Mar;100(2):126. ↑ 2.0 2.1 2.2 Katch V. Pregnancy And Physical Activity( 2017, February, 5). Retrieved from http://michigantoday.umich.edu/pregnancy-and-physical-activity/. ↑ 3.0 3.1 Evenson KR, Savitz A, Huston SL. Leisure‐time physical activity among pregnant women in the US. Paediatric and perinatal epidemiology. 2004 Nov;18(6):400-7. ↑ Barakat R, Perales M, Garatachea N, Ruiz JR, Lucia A. Exercise during pregnancy. A narrative review asking: what do we know?. Br J Sports Med. 2015 Jul 1:bjsports-2015. ↑ Davenport MH, Steinback CD, Mottola MF. Impact of pregnancy and obesity on cardiorespiratory responses during weight-bearing exercise. Respiratory physiology & neurobiology. 2009 Jul 31;167(3):341-7. ↑ Gaillard R, Durmuş B, Hofman A, Mackenbach JP, Steegers EA, Jaddoe VW. Risk factors and outcomes of maternal obesity and excessive weight gain during pregnancy. Obesity. 2013 May;21(5):1046-55. ↑ Hedderson MM, Gunderson EP, Ferrara A. Gestational weight gain and risk of gestational diabetes mellitus. Obstetrics and gynecology. 2010 Mar;115(3):597. ↑ James Ford Clapp III MD, Capeless E. Cardiovascular function before, during, and after the first and subsequent pregnancies. The American journal of cardiology. 1997 Dec 1;80(11):1469-73. ↑ Geva T, Mauer MB, Strikera L, Kirshon B, Pivarnik JM. Effects of physiologic load of pregnancy on left ventricular contractility and remodeling. American heart journal. 1997 Jan 1;133(1):53-9. ↑ Gilson GJ, Samaan S, Crawford MH, et al. Changes in hemodynamics, ventricular remodeling, and ventricular contractility during normal pregnancy: a longitudinal study. Obstet Gynecol 1997;89:957–62. ↑ Bennett HA, Einarson A, Taddio A, Koren G, Einarson TR. Prevalence of depression during pregnancy: systematic review. Obstetrics & Gynecology. 2004 Apr 1;103(4):698-709. ↑ Artal R, O'toole M. Guidelines of the American College of Obstetricians and Gynecologists for exercise during pregnancy and the postpartum period. British journal of sports medicine. 2003 Feb 1;37(1):6-12. ↑ Garshasbi A, Faghih Zadeh S. The effect of exercise on the intensity of low back pain in pregnant women. International Journal of Gynecology & Obstetrics. 2005 Mar 1;88(3):271-5. ↑ Elden H, Ladfors L, Olsen MF, Ostgaard HC, Hagberg H. Effects of acupuncture and stabilising exercises as adjunct to standard treatment in pregnant women with pelvic girdle pain: randomised single blind controlled trial. Bmj. 2005 Mar 31;330(7494):761. ↑ Clapp III JF. The course of labor after endurance exercise during pregnancy. American journal of obstetrics and gynecology. 1990 Dec 1;163(6):1799-805. ↑ Salvesen KÅ, Stafne SN, Eggebø TM, Mørkved S. Does regular exercise in pregnancy influence duration of labor? A secondary analysis of a randomized controlled trial. Acta obstetricia et gynecologica Scandinavica. 2014 Jan 1;93(1):73-9. ↑ Tinloy J, Chuang CH, Zhu J, Pauli J, Kraschnewski JL, Kjerulff KH. Exercise during pregnancy and risk of late preterm birth, cesarean delivery, and hospitalizations. Women's Health Issues. 2014 Jan 1;24(1):e99-104. ↑ Mørkved S, Bø K. Effect of pelvic floor muscle training during pregnancy and after childbirth on prevention and treatment of urinary incontinence: a systematic review. Br J Sports Med. 2014 Feb 1;48(4):299-310. ↑ Benjamin DR, van de Water AT, & Peiris CL Effects of exercise on diastasis of the rectus abdominis muscle in the antenatal and postnatal periods: a systematic review Physiotherapy. 2014 Mar;100(1):1-8. 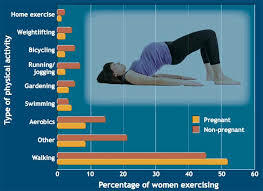 ↑ Meher S, Duley L. Exercise or other physical activity for preventing pre‐eclampsia and its complications. Cochrane Database of Systematic Reviews. 2006(2). ↑ Tobias DK, Zhang C, Van Dam RM, Bowers K, Hu FB. Physical activity before and during pregnancy and risk of gestational diabetes mellitus: a meta-analysis. Diabetes care. 2011 Jan 1;34(1):223-9. ↑ Bain E, Crane M, Tieu J, Han S, Crowther C, Middleton P. Diet and exercise interventions for preventing gestational diabetes mellitus. ↑ Dempsey JC, Sorensen TK, Williams MA, Lee IM, Miller RS, Dashow EE, Luthy DA. Prospective study of gestational diabetes mellitus risk in relation to maternal recreational physical activity before and during pregnancy. American journal of epidemiology. 2004 Apr 1;159(7):663-70. ↑ Nascimento SL, Surita FG, Cecatti JG. Physical exercise during pregnancy: a systematic review. Current Opinion in Obstetrics and Gynecology. 2012 Dec 1;24(6):387-94. ↑ Clapp III JF, Kim H, Burciu B, Lopez B. Beginning regular exercise in early pregnancy: effect on fetoplacental growth. American journal of obstetrics and gynecology. 2000 Dec 1;183(6):1484-8. ↑ 30.0 30.1 30.2 30.3 30.4 30.5 30.6 30.7 Mottola MF, Davenport MH, Ruchat SM, Davies GA, Poitras VJ, Gray CE, Garcia AJ, Barrowman N, Adamo KB, Duggan M, Barakat R. 2019 Canadian guideline for physical activity throughout pregnancy. Br J Sports Med. 2018 Nov 1;52(21):1339-46.